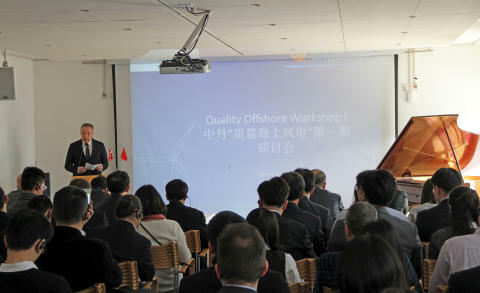 On Friday 09 March 2018 the Danish Energy Agency and the Embassy of Denmark to China hosted a workshop with more than 65 participants on offshore wind in China. Part of the Quality Wind project, the workshop focused on both regulation and on improving the conditions for investments in in industry which is about to take off. Director General Zhu Ming from NEA as well as the Danish Ambassador to China, Carsten Damsgaard opened the workshop with speeches. China has a long coastline of some 13,000 km and estimates say that technical potential for offshore is around 500 GW counting water depths below 50 meters. This complex industry is still young but gaining momentum and 2017 brought about more than 1 GW of newly commissioned projects, bringing the cumulative total to around 2.8 GW. Up to now, this development has relied mostly on domestic know how and experience as foreign advisers and inputs have been limited. Bringing in foreign expertise can help to ensure that Chinese offshore wind energy is developed according to best-practice. The workshop was attended by a number of Chinese central and provincial authorities, as well as engineering institutions and developers. On the Danish side, several representatives from Danish developers, supply chain companies and consultants participated. One of the Danish participants was Rambøll, who has successfully entered Chinese offshore with contracts on foundation design. The project was praised by several of the Chinese participants, calling for a continuation of project activities. The cooperation is one of the outcomes from the visit to Denmark of NEA Administrator Nur Bekri last September. During his meetings with the Danish Minister for Energy, Utilities and Climate, the ministers agreed to initiate cooperation within offshore with an aim to exchange experience on regulatory matters, test and certification as well as look at opportunities for demonstrations projects. 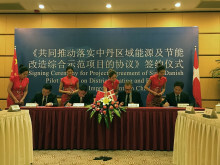 On the Danish side, the project is carried out in a close cooperation between the Ministry of Foreign Affairs, the Danish Embassy in Beijing and the Danish Energy Agency with the latter as project lead. 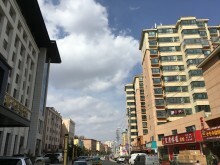 The project runs for one year (2018) with a possibility for extension. The Danish Minister Lars Chr. Lilleholt is scheduled to visit China in June 2018 accompanied by a Danish industry delegation. 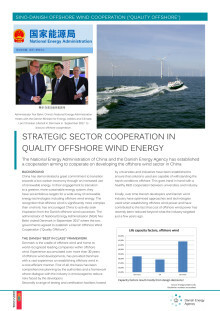 Read the factsheet “Sino-Danish Offshore Wind Cooperation (“Quality Offshore”)”. China and Danmark started government-to-government collaboration on energy in 2006. Since then a long range of activities within renewable energy, scenario planning, power system flexibility, energy efficiency etc. have been carried out in an ever closer relationship between the two countries. Denmark supported the creation of China National Renewable Energy Center in Beijing in 2011 and this center has now established itself as a key think tank for China’ transition to a green energy system.